This week noted Canadian academic and anti-poverty advocate, Dennis Raphael, released the second edition of Poverty in Canada. 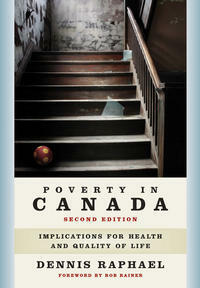 Featuring a foreword by Canada Without Poverty Executive Director Rob Rainer, and the late Jack Layton, the book examines the connection between poverty and health, and provides in-depth analysis on the effects of poverty in Canada. Dennis Raphael is a Professor of Health Policy and Management at York University, and has produced numerous articles on the social determinants of health, which cites poverty as a key issue causing adverse health outcomes. Pointing to health inequities in low-income populations, Raphael recognizes that poverty can cause stress, lead to diabetes, mental illness, heart disease, and even early death. In this edition of Poverty in Canada, Raphael continues to draw on lived experiences of poverty as well as academic research, noting the destructible force of poverty on individuals, families and society. Canada Without Poverty Executive Director Rob Rainer calls this book, “the single most valuable reference on poverty in Canada”, and believes that the information it holds persuasively argues that poverty should be “a top five public policy priority for governments in Canada”. As a co-founder and co-coordinator of Dignity for All: the campaign for a poverty-free Canada, Rainer has long stated that a comprehensive federal strategy on poverty is necessary to adequately address the problem, a solution Raphael speaks to in his final chapter. The original book was written as a text for one of Raphael’s courses, but has become a key source of information on poverty and health inequities that adds substantial weight to the call for a federal poverty elimination strategy. A new chapter on anti-poverty programs examines various programs currently in place across Canada concluding that most lack significant impact. Raphael does, however, mention Quebec and Newfoundland are provinces making headway on poverty through coordinated provincial poverty plans, and offers insight on how to move forward. From ideas on poverty measurements appropriate for Canada (currently there is no official tool used to measure poverty), to a look at the causes of poverty, and finally the immense social and health implications, Poverty in Canada is a robust assessment of the issue. A ‘must read’ for everyone interested in eliminating this grave injustice, and creating a more equal society.